Let me say specifically about Susan Rice: She has done exemplary work….If Senator McCain and Senator Graham and others want to go after somebody, they should go after me. And I’m happy to have that discussion with them. But for them to go after the U.N. ambassador? Who had nothing to do with Benghazi? And was simply making a presentation based on intelligence that she had received? To besmirch her reputation is outrageous. Mr. President, don’t think for one minute I don’t hold you ultimately responsible for Benghazi. I think you failed as Commander in Chief before, during, and after the attack….Given what I know now, I have no intention of promoting anyone who is up to their eyeballs in the Benghazi debacle. Early in the day, there were demonstrations in Cairo inspired by a hateful YouTube video. This in turn appeared to have inspired a “copycat” protest in Benghazi. That protest was then “hijacked” by extremists, who used it as an excuse to storm the consulate and murder four Americans. That’s it. That’s the formulation she used on Face the Nation, Meet the Press, This Week, and State of the Union. She was very cautious, too, emphasizing that an investigation was ongoing and this was the “best information” available at the time. And it was: this was what the intelligence community told her in briefings before she taped those interviews. Out of all that, the only thing she got wrong was her suggestion that there had been a copycat protest in Benghazi. “The facts are there was never a riot,” Graham said, and he was right. But he said that a month later. By then, everyone knew there hadn’t been any riots. Back on September 15th, when Rice’s TV appearances were taped, we didn’t. Berating Rice, who had nothing to do with Benghazi aside from representing the administration on these talk shows, is nuts. The intelligence community was wrong about one relatively unimportant fact, and Rice passed along that mistake. That’s it. There’s no coverup, no conspiracy, no incompetence, no scandal. And one more thing: mainstream press outlets that report on this need to start being more careful. 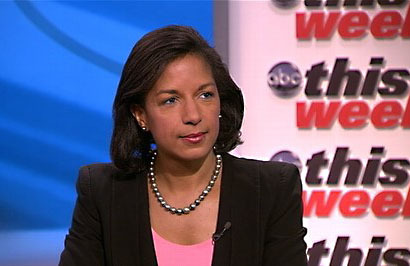 No breezy summations suggesting that “Rice blamed the attacks on a video.” She didn’t. If you’re going to report on this, you need to report on what Rice actually said, and you need to make clear why she said it. This is real life, not a video game.